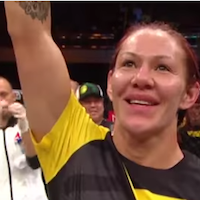 Wow, it looks like Cris Cyborg may be coming back sooner than expected. She was notified of a potential failed drug test by USADA in December but UFC President Dana White tells ESPN’s Brett Okamoto that things are looking good with that and she apparently was legitimately using the medicine she was flagged for. Not only that, but the UFC boss says he expects the winner of the UFC 208 main event on Saturday between Holly Holm and Germaine de Randamie to make their first title defense against Cyborg. Could this be considered a bittersweet win for Holm or de Randamie when one of them takes home the inaugural UFC women’s featherweight title? Yes, they get a new shiny belt and all that comes with being champion. But then they get the grand prize of getting to fight female MMA’s most notorious badass on top of it. Ouch. Holm just had her bantamweight title taken from her, hence the move up to featherweight. To have that happen again in another weight class would certainly sting.